Blogs, coupons, and content from real travelers exploring a variety of Colorado activities including camping, whitewater rafting, jeep tours, ATV trails, hiking, biking, dining, lodging, fishing, ziplines, horseback rides, shopping, and more. Located on the left side of Poplar Street (Chaffee Co Rd 162) as you enter town. The larger building was the stable for the Pawnee Mill and the smaller building was the Blacksmith Shop. The Pawnee Mining & Milling Company owned the property from 1892-1913. Located on the north (right) side of Poplar Street as you enter St Elmo. The only home that was built as a 2-story. All other homes in the St Elmo area were 1 or 1-1/2 stories. The addition on the south was most likely added around 1890. Built by expressman R. McKenzie around 1885. Other owners included: Mrs. Annie Hovey 1894-1911, Charles Andreen 1911-1914, and Mary Ottoson 1914-1920. One of the few commercial buildings constructed during the final boom of 1908-1917. It was built in 1908 by saloon proprietor Charles Hellman who owned the property from 1907-1913. Miners would come here to cash their paychecks or to exchange gold dust & nuggets for cash. Saloon keeper Patrick Hurley owned the Miner's Exchange from 1916-1929. Today it is the St Elmo General Store. 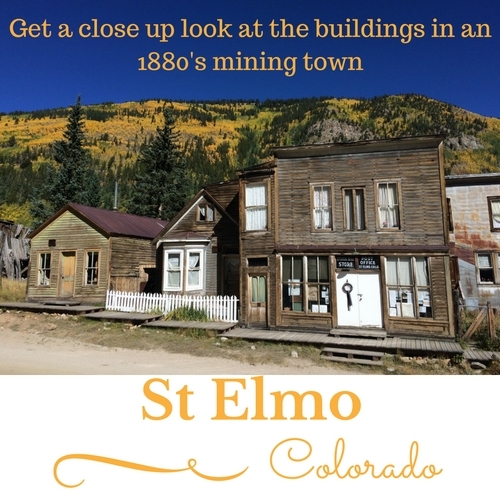 The General Store is open from Mid-May to October, selling St. Elmo Souvenirs, snacks, antiques, & chipmunk food. There is also a 1 room rental cabin next next door. Next to the Miner's Exchange on the north side of Main Street is the Yockey - Doyle Building. Shoemaker Lewis Yockey owned this property from 1883-1896. The original building was destroyed in the fire of 1890. Barber John Doyle rebuilt the current building during his ownership from 1896-1907 and possibly used it for his barbershop. Saloon keeper Patrick Hurley turned it into a notions shop for a time during his ownership from 1907- 1929. Built in 1892/93 on the western part of the site where the 1880's Clifton Hotel stood before being destroyed in the fire of 1890. Bed & Breakfast located on the south side of Main Street. Be sure to feed the chipmunks at the timber pile on the south side of the street. Watch out for the larger ground squirrels. They might bite! This stone wall is credited with saving the western half of town during the fire of 1890 that destroyed all buildings east of the wall. It was constructed in the early 1880's as the east wall of Griffith Evans' General Store. Evans was the president of the St. Elmo Land & Improvement Company. In 1888 Evans sold the building and wall to John M Whittenberger & WS Raymond, who continued to operate a general store there. Whittenberger owned the property until 1923. Sometime after 1900, Peter Savard built the building on the left side of the wall. He owned that property from 1891-1909. Helping you explore central Colorado. Blogs, coupons, and content from real travelers exploring a variety of activities including camping, whitewater rafting, jeep tours, atv trails, hiking, biking, dining, lodging, fishing, ziplines, horseback rides, shopping, and more. Our adventures take place in the Upper Arkansas River Valley and across the Continental Divide into the Gunnison National Forest as well as everywhere in between. Leadville, Buena Vista, Salida, Gunnison, & Crested Butte.